Thanksgiving is right around the corner, and there is no better holiday to gather all your loved ones and share in memories new and old. It’s one of my favorite times of the year. The combination of good food, beautiful fall decorations, and family members make it a day to be cherished. And why not make your decorations as loved as the company? Below are some cute and unique ideas to add a special splash to your Thanksgiving table. Try some out and, if you like the result, send me the photo! I would love to see what you create. 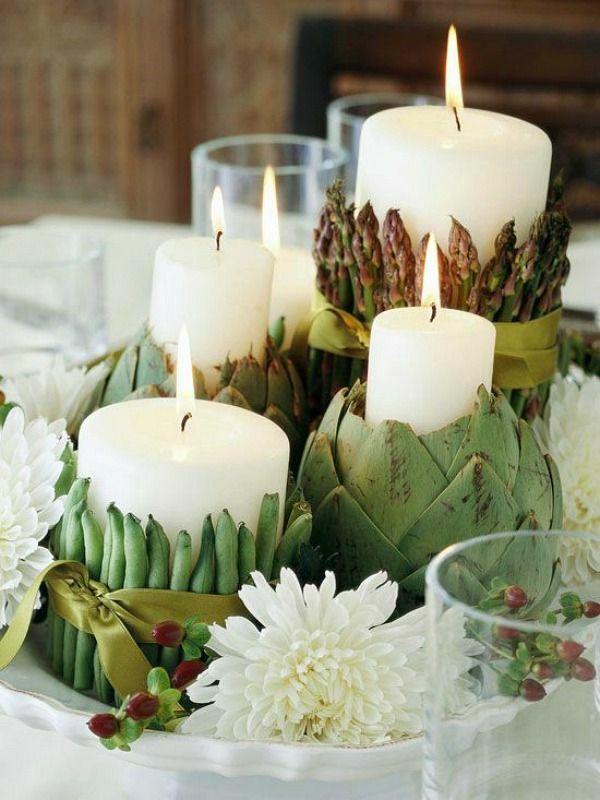 Here are some fantastic ideas to spice up your candles during Thanksgiving. The first suggestion is apples candles. 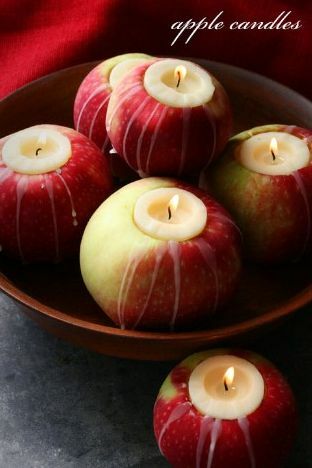 Hollow out the top of several apples and place a tea candle inside, creating a cute centerpiece for any table. But fruits aren’t the only way decorate a candle. Below is another example, this time using vegetables to add a little flavor. Finally, take Thanksgiving back to its roots in this candle decoration. 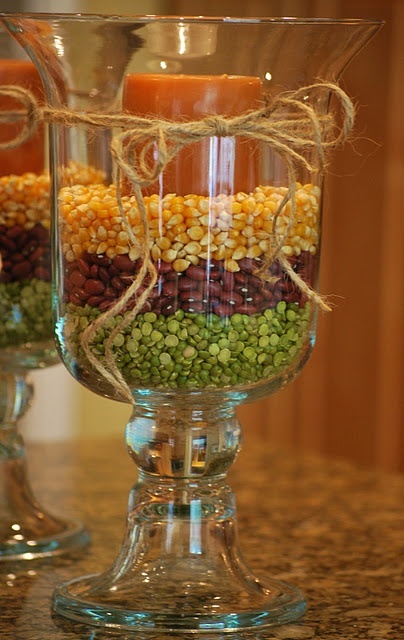 Pour split peas, dried beans, and corn kernels into a clear glass jar or vase and place a candle on top. How simple is this? And yet it would look so beautiful on your table. Pumpkins and gourds are another great centerpiece that never go out of style! Paint one white and adorn it with bittersweet berries like above or stack a group of pumpkins and gourds in glass vases like below, and you have a simple but beautiful decoration. This amazing decoration pictured above was made with dollar store glasses and alphabet stickers, and then filled with cinnamon sticks, acorns, and pinecones! Together, all the materials make a super cute centerpiece for a mantel or even a table. Want to see more fun ideas? Check out our Pinterest board for Thanksgiving table settings. Have a happy and safe Thanksgiving!